Is the UK falling out of love with capitalism? Posted 12th October 2017 & filed under Blog. Ever since the rise of Thatcherism during the 1980s, the dominant philosophy guiding successive British governments has been neoliberalism – essentially, the idea that free markets are the solution to most of society’s problems, and the main role of the state should be to get out of their way. Neoliberalism has completely changed how the state works in Britain, having inspired the gradual privatisation of most of Britain’s state-owned enterprises and the creation of internal markets within many public services, such as the NHS, schools and universities. Right up until Labour’s election manifesto earlier this year pledged to re-nationalise some of the former state-owned industries, there had been no serious disagreement between the two largest parties for over three decades that privatisation and marketisation were the only route towards electoral success. However, the fact that Jeremy Corbyn’s significantly more left-wing set of policy pledges appeared to strike such a chord with the electorate suggests that the public may be keen on a change in direction. Since then, the findings of a new survey appear to suggest that a large section of the general public is strikingly opposed to the neoliberal status quo. What did this survey find, and what could this shift mean for intergenerational fairness? As most people are aware, the Labour government following World War Two nationalised most of Britain’s most important pieces of infrastructure, including the railways (most of which had previously been privately owned) and the utilities such as water, electricity and gas (many of which had been owned by local councils). Public displeasure at the deteriorating condition of many of these services, combined with the fact that they were generally loss-making and often hit by large-scale strikes because of poor industrial relations, led to the Conservative governments that were in power between 1979 and 1997 selling most of them off to the private sector in the belief that the discipline of the market would force them to improve. 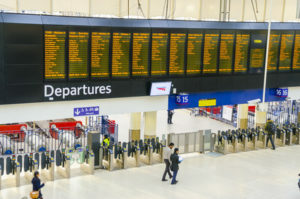 However, the general public clearly still isn’t happy with the quality of many of these services in their modern form, as evinced for example by the widespread criticism which Thames Water, Southern Rail and British Gas have received for various scandals and service failures over the past few years. Despite the view which has been held by most politicians on both left and right over the past three decades that privatisation and marketisation were the only games in town, the new survey by right-wing think tank the Legatum Institute suggests that this sense of dissatisfaction with privatised industries runs much deeper than previously thought. The Legatum Institute commissioned the polling company Populus to undertake a survey of economic attitudes among the British public which led to their recent report called Public opinion in the post-Brexit era: Economic attitudes in modern Britain. Among other things, this found that majorities of the public favour the re-nationalisation of the UK’s water (83% of adults), electricity (77%), gas (77%) and railway (76%) sectors. The survey findings also suggested that the majority of the public would be in favour of more regulation for businesses operating in the UK, caps on the wages of CEOs and compulsory worker representation on the boards of British companies, and also want to abolish zero-hours contracts. When asked how they viewed “capitalism” as a concept, the majority of adults said that they saw it unfavourably, associating it with the words “greedy”, “selfish” and “corrupt”. Over half the adults in the sample took a more favourable view of socialism than capitalism. The majority were also firmly in favour of a publicly-run NHS, and said they thought that taxes should rise to provide additional funding for it. From an intergenerational perspective, an important question which this research raises is whether or not there is evidence to suggest that a generational shift is underway. If the UK public is falling out of love with free markets, then it could because of a cohort effect (i.e. younger people are less in favour of them than older people) or a period effect (i.e. everyone is becoming less keen on them because of external events, such as the financial crisis). Intuitively, it would seem more plausible for it to be the former, both because younger people flocked to Jeremy Corbyn’s Labour at the last general election in far greater numbers than older ones (most of whom voted Conservative), and also because it would arguably make more sense for the generation which has grown up under the last thirty years of neoliberalism to find the prospect of an alternative more appealing than it would for older people who can remember the economic crises and industrial disputes of the 1970s to do so. However, the Legatum Institute’s survey actually suggests that this is a period effect; they found that support for greater public ownership and tighter economic regulation was more or less even across the different generations. To put it another way, age was not a useful predictor of how likely someone was to express scepticism towards capitalism and free markets. Where there was a much bigger gap between the generations was on a different set of questions which the survey also asked about social attitudes; young people were much more likely to express socially liberal views, such as support for gay marriage, than older people were, as many other pieces of research have found. Yet on these key economic issues, young and old appear to be remarkably united. What does this mean for British politics? If you take these findings at face value then it suggests that British politics may have reached a major turning point. It has actually been apparent for some time that the public say they want more government intervention to curb what are seen as the excesses of the private sector: YouGov polling that was carried out before the 2015 general election in response to Labour’s promise to cap energy prices showed that a majority of voters said they supported nationalising energy and rail companies, including over half of Conservative voters. There is no doubt that politicians across the party divide have taken some heed of the public’s changing mood, as demonstrated by Theresa May – who appears to be the least pro-market Prime Minister Britain has had for a very long time – recently renewing her pledge to intervene in energy markets, and her announcement that she wants the public sector to start building housing on a large scale again. However, these are still relatively tentative pledges in comparison to full-scale nationalisation of entire industries. The bigger question is whether this apparent hostility towards free markets really should be taken at face value. It is worth bearing in mind that even though such large numbers of voters appear to feel this way, Jeremy Corbyn’s Labour Party still received over 791,000 fewer votes earlier this year than Theresa May’s Conservatives, which suggests that these big philosophical questions about the role of the state were far from the only thing on voters’ minds when they went to the polls. Of course, voters are more than capable of saying things to pollsters which either don’t accurately reflect how they go on to vote subsequently, or are in direct tension with other views that they hold. Interestingly, although the participants in this survey registered such strong support for greater state intervention, when they were asked whether they thought public sector austerity should continue, the majority (including a small majority of young people) said that it should; in other words, they seem to want the state to become both bigger and smaller at the same time, given that nationalisation of major industries couldn’t possibly be achieved without the state spending a lot of money on buying out private shareholders. Looking at things in the round, perhaps what this survey suggests is that there is a fairly widespread dissatisfaction with the way that capitalism works in contemporary Britain which is actually quite widespread between different generations (rather than being a view which is only held by younger voters), but which is also matched by a fairly substantial distrust of the government’s ability to provide the right answers to the problem. Whether a revival in post-war style government intervention can actually address the underlying causes of this dissatisfaction is anyone’s guess.